The Emergency Services College has developed emergency medical care simulation learning from the time the college was established. The training ground and the possibilities it allows to carry out simulated patient treatment situations are excellent. In addition, there is a simulation emergency medical care learning environment at the college campus, which was built in 2005. In spite of its name, the simulation environment can be used for the realisation of many other simulation exercises not just emergency medical care. The most typically used environment is of course emergency medical care of injuries at home and trauma environments, but the space has also been used as an assisted living centre, a psychiatric treatment facility, a hospital emergency care room, a ward etc. Simulation learning of emergency medical care is a teaching method-based entity, which aims to promote the formation of a student’s internal model of a safe and appropriate operating model for work assignments, which emphasises self-assessment and positive feedback. Simulation learning is based on the constructive realistic experience-based learning concept according to which the student builds his/her learning on top of a foundation of previous experiences self-assessing his/her learning. The teacher acts when necessary as a safety net and ensures that the situation is realistic; the responsibility for learning cannot be left entirely to the student and the student must not be left adrift. The gained experience is most evident when people with some work experience take part in learning situations, as they can interactively bring their own strong expertise to the leaning situation. Objectives have been drawn for the event and there is a plan for execution that supports these. Corresponding real operating environments are copied and modelled. An effort is made to complete a simulation exercise with no interruptions. The audio-visual materials recorded during the exercise can be saved and used to support the following learning discussion. The event includes three phases that distinctly differ from one another. – Activation of participants, briefing. Our simulation learning environments are divided into four rooms that are described below. Of these rooms, the monitoring room and skill workshop can be combined into one large space e.g. for emergency medical care situational leadership training of map reading skills, according to the requirements of a simulation instructor course or it can be used as a normal classroom. The skill workshop is intended for practising individual hand skills, such as opening endosteal access, ensuring that the patient is breathing, administering care to a broken limb, etc. The same kind of skill workshops or group work spaces can be quickly built in numerous classrooms at the college. In the simulation room students work in an environment that is as reality-based as possible. In the simulation room there is a home-like environment and a so called trauma environment where different injury scenarios can be built. In order to clarify the situation video, audio and image materials as well as props (bike helmets, bicycle, ladder, building materials, etc.) can be used. The simulation room can be staged into a hospital’s treatment room or a patient room in which case it is possible to carry out simulations for hospital personnel. Audio-visual material can also be saved in the simulation room. Normally, only the people carrying out the simulation are present in the simulation room to guarantee that the situation feels as authentic as possible. The roles of patients can be played by students, teachers, patient actors, and various patient simulators. With the help of patient simulators it is possible to create a situation picture that is nearly identical to one with a real patient. The simulator’s breathing and circulation status can be nearly fully evaluated, problems in the respiratory tract can be simulated to a considerable extent, the patient speaks and answers question or makes sounds in a way that is appropriate for the situation etc. All the symptoms and findings that can be directly measured and determined from the simulator without external input from the teacher make the situation picture seem more authentic. During a simulation, at least two teachers are working in the monitoring room. One of the teachers controls the functions of the patient simulator or guides the patient actor, for example, by using Virve (the Finnish authority communications network). The other teacher controls the actual simulation by providing necessary information to the simulation room via the loud speaker, telephone or Virve. The students who are not in turn to take part in the simulation, follow the simulation in the observation room (studio audience). In this way, they can comment on what is happening among themselves without disrupting the simulation event. When possible there is a third teacher present in the observation room during the first stage of the simulation, who can join the exercise at a later time in the role of an emergency medical care situation leader or emergency medical care supervisor (L4 and L5). The students in the observation room can see and hear everything that takes place in the simulation room in real-time. The monitoring data from the patient simulator can be viewed in the observation room and patient documents as well as e.g. EKGs are available. After the simulation exercise, simulation participants, the studio audience and the teachers that directed the simulation gather in the observation room for a learning discussion. The learning discussion is carried out according to a pre-planned structured way emphasising positive feedback and the student’s self-evaluation. The planning of simulation training for emergency medical care is carried out for each student group or for each group of in-service training. Each training exercise is carefully planned with competency based learning objectives, for example, according to Blooms taxonomy. These objectives steer the preparation of simulation exercises so that it is possible for the group in question to achieve the objectives during the exercise. The emergency medical simulation training is carefully prepared and the structure, staging, situation picture and patient description as well as the additional material of the exercise all serve the objectives set for each exercise. 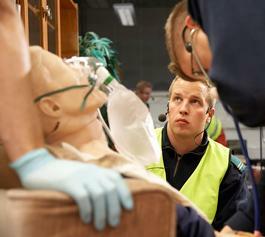 The Emergency Services College provides vocational education for firefighters, sub-officers, fire officers and emergency response centre operators in Finland. We also offer a wide variety of specially tailored further training and in-service training for national and international professionals in the rescue and emergency field. We are also responsible for the training and recruitment of Finnish experts to international civil protection missions.